Also includes blank templates or edit the text of any of the included warm ups to fit your classroom needs. 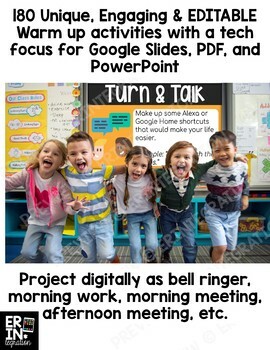 Project one activity each day as students enter the room, during morning meeting, or at the end of the day / class period. Each activity takes on average 5 minutes to complete. 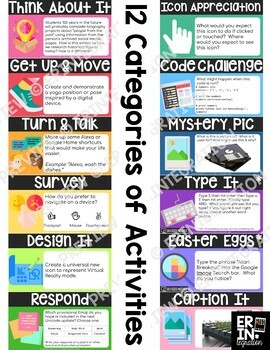 Activities can be completed with or without paper, on whiteboards, with sticky notes, or use the included printable response sheets. Suggestions are given in the direction packet for each question type. 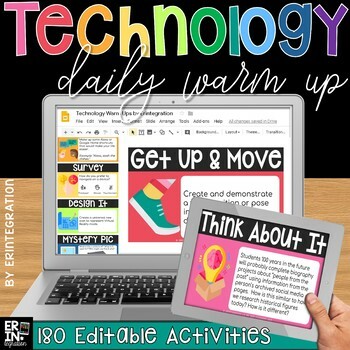 These warm ups are NOT just for technology teachers. Questions are geared to all comfort levels of technology. Teacher notes in the margins of slides will support classroom teachers not familiar with some terms and images. 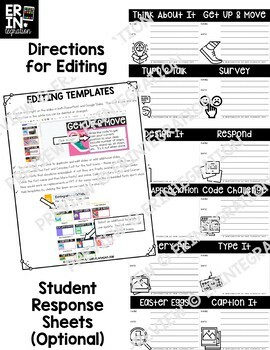 Zip file includes packet with a PDF of directions, printable response sheets, and a copy of the daily warms plus a link to the Google Slideshow and a PowerPoint file. The Google Slide and the PowerPoint file are editable. Emojis provided by EmojiOne used with permission.